Everyone knows about the giant sequoia, California's best-known endemic speciesone that occurs nowhere outside the state. Not so many know about the blue oak (Quercus douglasii), but you see it whenever you leave the Central Valley in any direction. Blue oaks populate the dry hills all around the valley's edge, starting as scattered specimens in the savanna and thickening with altitude into a proper forest. Higher up, they tend to give way to conifer forests. Their name comes from the bluish green of their leaves. Blue oaks don't make good timber and they don't interfere with cattle, so the blue oak habitats have been surprisingly little touched by Western civilization. And the trees can live much longer than we've given them credit for. 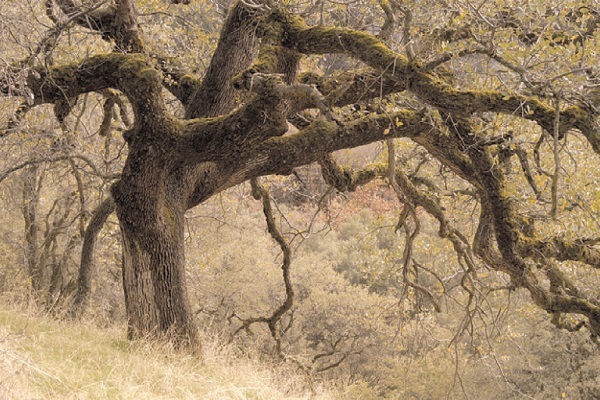 "In fact," says David Stahle, a tree-ring specialist at the University of Arkansas in a new paper on the blue oaks, "the remnant old-growth blue oak ecosystem may be one of the most extensive presettlement woodland cover types left in California." Stahle's paper in the journal Earth Interactions describes a large set of tree-ring records from blue oak populations that document California climate back to the mid-1300s. 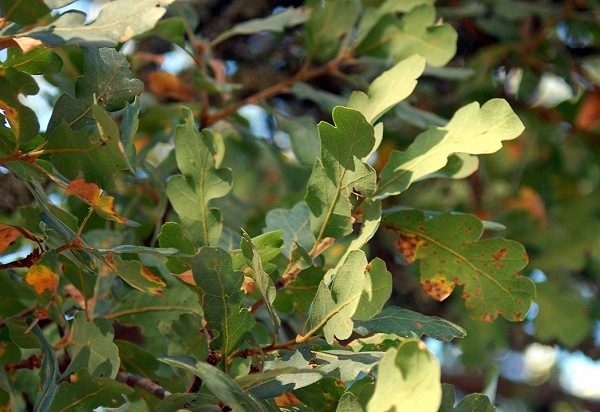 Blue oak is a tough, drought-resistant tree that can shed its leaves when necessary. It also grows very slowly and doesn't reach much more than 50 feet in height. A waist-high seedling can be 40 years old; a modest, scraggly specimen may have taken centuries to mature. Stahle's team found a tree growing near Coalinga with 459 annual ringsand heart rot that had erased its earliest years. (Living trees are studied by extracting pencil-sized cores from their trunks.) They found another one, dead since 1884, with 553 rings. 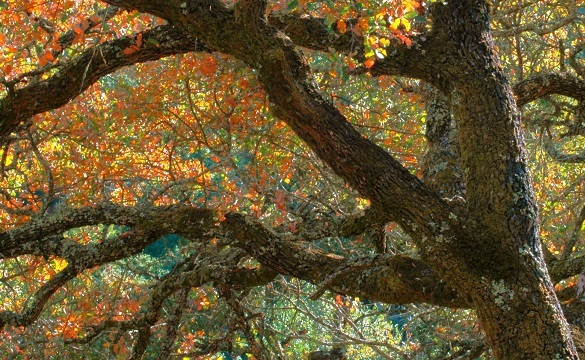 While that's far short of the millennium-scale lifespans of the redwood, sequoia and bristlecone pine, it puts blue oaks among the longest-lived hardwood trees (angiosperms). This blue oak in Sequoia National Park is 350 years old. From Stahle et al. Blue oaks are sensitive to rainfall, putting on thick rings of wood in good years and thin ones, fractions of a millimeter thick, during droughts. 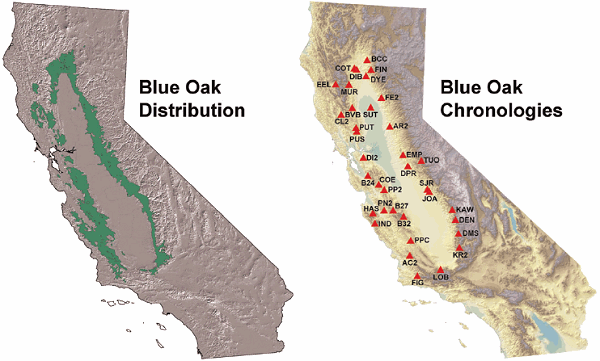 Stahle's team sampled over a thousand trees in 36 different blue oak populations (including one on Mount Diablo) to outline almost 700 years of rainfall in the Central Valley and Coast Range. The southernmost groves correlate well with Southern California rainfall. Analyzing separate rainfall records for northern and southern regions, the team documented periods when the large-scale weather patterns were shifted northward or southward. These in turn affect where atmospheric rivers, which dominate the winter rain totals, may strike coastal California. The north-south weather movements also affect water storage in Northern California, which supplies three-fourths of the water in the state's aqueducts. Knowing rainfall, the researchers could also model streamflow in California's major rivers, which in turn governs the amount of freshwater entering San Francisco Bay. By matching the blue oak record to almost 90 years of salinity measurements at Fort Point, in the Golden Gate, Stahle's team modeled the Bay's water back to the 1300s. They were able to show that human diversion of freshwater during the last century has made the Bay much saltier, such that its salinity levels during the drought years of 1976, 1977, 1988 and 1990 were the highest since 1332. Conversely, the El Niño floods of 1998 would have set a century-scale low in Bay salinity in the absence of human influences. San Francisco Bay salinity, modeled from the blue oak precipitation record. The red curve is the actual record in recent years, affected by water withdrawals. From Stahle et al. Stahle's team thinks there should be some living blue oaks older than 600 years, "and a very few select individuals might be over 700 years old." If we can find those trees, we'll have a lot more to learn from this remarkable species. Seven centuries of environmental change are a good baseline from which to assess our range of probable futuresour deep presentand give them some thought as we make long-term plans. Although state and national parks preserve excellent stands of blue oak forest (as does the Wildlands Conservancy's Wind Wolves Preserve near Bakersfield), most of the ecosystem is on privately owned land. Preservation and good management of these lands may yield a continuing harvest of scientific data as well as the acorns that once sustained the native tribes.